When I initially received my new X1 Carbon I was very excited at the new hardware. More pixels, more lumens, more cores. After I got over my initial euphoria, I noticed that some things didn’t work, and confirmed such by a very helpful Archwiki page. Some of the things that didn’t work include ACPI suspend-to-RAM sleep (since corrected in a BIOS update), the the fingerprint sensor (still outstanding), and the WWAN LTE Cat9 card that Lenovo seems so proud about. It has all the LTE channels you could ever want and can achieve speeds of up to 150Mbit. It’s a pity that the Linux drivers are not up to snuff. 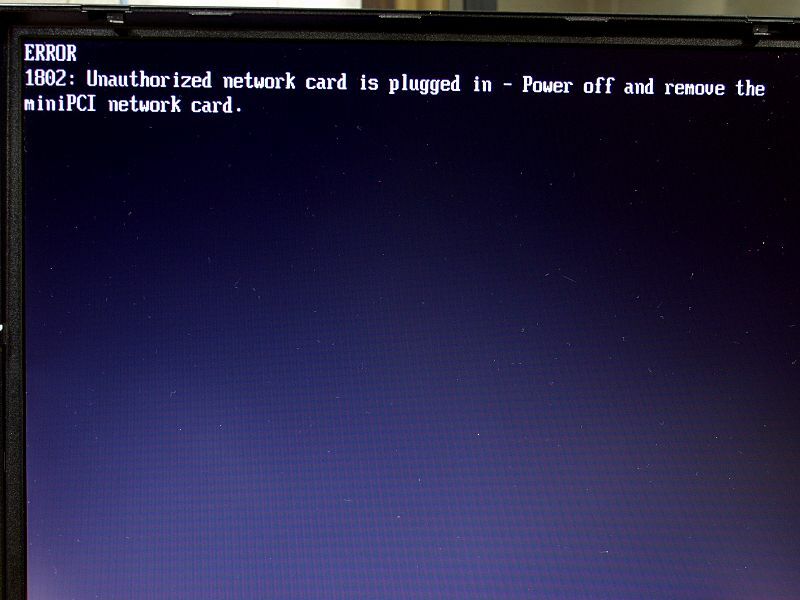 It was doubly disappointing because I had gotten used to the always-connected nature of having a WWAN card in my primary machine. The WWAN card included in USA-bound X1 Carbons is a Fibocom L580-GL. The card itself is primarily comprised of an Intel modem and chipset, which does have support in the Linux kernel (it is used in several Android phones). The reason it is unsupported on Linux is because of the interface they chose to use. Normally WWAN cards electrically use a USB interface, even if they are primarily found in a M.2 form factor inside a laptop. To support the higher data rate Lenovo decided to use the card’s PCI Express interface. This interface does not have support in the Linux kernel. Although the card itself enumerates (via lspci) as a device on the PCI bus, no driver will bind to it. Hopefully someday someone will boost the Linux support. In an attempt to get it to work, some enterprising owners even taped over the PCI Express pins on the card so that it would force connection over USB. Unfortunately this reveals another problem: Lenovo’s card whitelist. Lenovo disallows any card that is not in a list embedded in their signed system firmware. My online research had revealed that some folks had luck using some Sierra Wireless cards that had been used in previous ThinkPad models as well as other Dell laptops. So I did it. I went on eBay and purchased a Sierra Wireless 7455 LTE WWAN card. I removed the original Fibocom part and put it in. Unfortunately I was greeted with the very same whitelist screen. I knew from having previous Sierra Wireless devices that when running correctly it produced several serial console devices (/dev/ttyUSB[0-2]). Details in a Reddit post showed which commands I would have to run to make it work. The commands would alter the USB vendor and product IDs and set “fastboot” behavior for the card. The trick to bypassing the whitelist protection turned out to be a timeout. The card spend so long booting that the whitelist protection in the laptop’s system firmware times out. I spent the better part of a jetlagged morning trying to find any device in my house with a M.2 Key B slot. It turns out I had none other than the X1 Carbon discussed in this article. Frustrated, I went back to sleep and had a think. At some point in my rest I had an epiphany: if the card itself simply interfaces via USB, couldn’t I hotplug it after the laptop had booted? I immediately got up and gave it a shot: I removed the Fibocom card, booted the laptop, ran journalctl -xf to see log output, and closed the lid to put it to sleep. Then I took the bottom panel off and slotted in the new Sierra Wireless card, attaching both of the antennas. I closed it back up and opened my laptop. I watched delightfully as the card enumerated itself and was recognized by my system. I proceeded to flash the card via instructions that a very helpful person wrote, including links to native Linux binaries! Afterwards I reloaded the card, connected to the card’s serial console, and ran the AT commands from the earlier-mentioned reddit post. This disabled the card’s fastboot from cold system boot (but enabled for a warm-boot), enabled LTE (disabled low-power mode), and set the USB IDs. I crossed my fingers and rebooted my system. To my relief it Just Worked (TM). My system booted with nary an error and I was soon back in my regular desktop environment. I was able to add the card to NetworkManager, and was online. I did a SpeedTest and found the result to be perfectly sufficient: 60/30Mbit. Not as good as the original Fibocom card, but I’ll take it. Given that we got this card to work by simply relying on slow card bootup to bypass the whitelist, I wonder if the same can be done with the original Fibocom card. If we simply taped over the PCI-Express pins to force USB, and inserted the card after boot, could we also find a setting to slow boot enumeration so that it would cause the whitelist checking to timeout? Further research is needed.